GREENWOOD, S.C. – Greenwood is one of many U.S. cities in the path of the next total solar eclipse, expected to occur on Aug. 21, 2017, across the continent. Lander University, just north of Greenwood Uptown, is perfectly positioned for people to observe and record the historic event. This will be the first total eclipse in the U.S. since 1979 – and the first one to travel coast-to-coast in almost 100 years. The AAS estimates that more than 10 million people are in the 65-mile-wide path of the total eclipse – and more than 500 million in the U.S., Canada and Mexico will have an opportunity to see at least a partial eclipse. 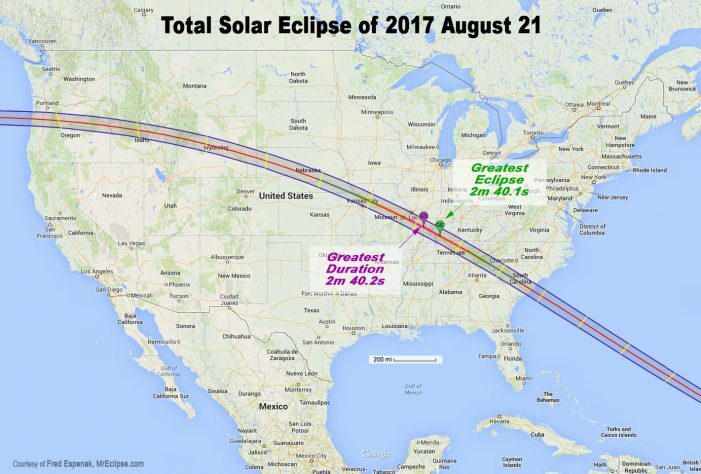 Based on AAS data and charts, the eclipse will touch over land at approximately 10:15 a.m. just north of Newport, Ore., and end its land sweep around 2:50 p.m. in McClellanville, S.C.
During that time, it will cross a total of 14 states including Idaho, Missouri, Kentucky and other parts of South Carolina. Greenwood’s time to witness the eclipse will come near the end of the sweep, starting around 2:39 p.m. and lasting for about 2.5 minutes. One Response to "Greenwood / Edgefield in the Path of Rare Solar Eclipse "
Why push folks to Greenwood? Edgefield County residents can see it perfect from the northern half of Edgefield County. An open field would be a perfect spot in the country!